Tonnages: 14,651 gross 10,051 net 23,710 deadweight. Main Dimensions: 534.3 x 75.2 x 34.2 feet. Cargo Handling: Fitted with four electric hydraulic deck cranes of 16 tons SWL suitable for grab handling. Engine: Two Stork Werkspoor Diesel 12 TM 410 Medium Speed Engines. 12,000 bhp, 15 knots. 1972:	Completed by Haugesund Mekaniske Verksted, Haugesund (Yard No. 45) for Cape York Shipping Co. (Lyle Shipping Co. Ltd., Glasgow.) Scottish Ship Management Ltd., Glasgow, managers. 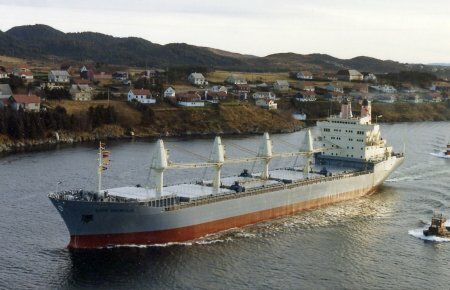 Maiden Voyage: Haugesund to Galveston, Texas, loaded grain for Japan. 1984:	Managers became Lyle Ship Management Ltd., Glasgow. Registry transferred to Bermuda. 1984:	Sold Ocean Shelf Trading Inc., Panama flag, renamed CAPE GWADAR. Total constructive loss after being attacked in the Persian Gulf, Iran-Iraq conflict.